OK, so we all know that Six Sigma is mostly repackaging things that have been around for awhile. The stated intention was to make using statistics and experimental design easy enough so that process experts could use them to solve problems in their processes. A laudable goal, but as you probably can guess by now, I think we have gone too far at times and ended up with "Black Box Black Belts" who have only been trained to enter data, click on buttons, and go with the answer that comes out of the software. This will work occasionally (giving the poor Black Belts a sense of false confidence), but will eventually turn around and bite them in the... back. One of those areas that got dropped was the process of performing research—industrial or otherwise. If someone doesn't know about this process (or even that there is one), he is at grave risk of doing a lot of work only to have nothing in the end to show for it, or a "solution" that is worse than the problem. When do we use an experimental design process? Well, as you will see below, since it is compatible with DMAIC (or whatever problem-solving process you prefer), it is applicable to the entire project. But let's say that during the course of solving the big problem (scrap rate, for instance), you also find that you need to study a smaller component of the process with data (maybe the concordance of those scrapping the product). So here is the rule: Any time you set out to collect data, you should be more than halfway through your research design process. Yes, I said "any time," and I mean it. It doesn't take long to do, and it will save you tons of time and money. So let's go over a process for designing research. There are others, but this is the one I think is best. In later articles, I'll explore some of the specific (and overlooked) tools used in the steps. This time, I'll just do an overview of the process. As Douglas Adams wrote, "Don't panic!" There is nothing here that is conceptually difficult. First off, take a look at the size of each of the slices, which are more or less proportional to the time that should be spent on it during research. In Black Belt training, we spend a lot of time on the statistical tools because it takes time for people to learn everything they need to know to be effective and not dangerous. But in terms of actually working on a project, a far higher proportion of time should be spent on planning the experiment. If you do your planning correctly, the analysis is a very small part of the study. Note also that the data are not collected until after the planning phase. I know it seems obvious, but I have talked with more than one Black Belt who told me stories of starting off collecting data or designing an experiment before they really understood what the problem was. Another thing that should be obvious now that we are looking at a picture of the process, is that you don’t design the experiment until you have figured out the variables you want to vary (treatments) as well as the variables for which you need to control (all other independent variables). Many an experiment has not been confirmed because of a failure to do the latter. 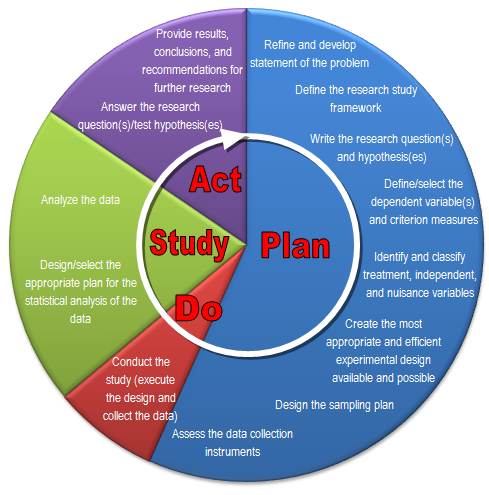 Finally, everything in the research process follows the plan-do-study-act process popularized by W. Edwards Deming. Of course this is no surprise because PDSA and DMAIC are nothing more than different interpretations of the scientific method. Well, that gets us started, anyway. Next month I’ll delve more into the individual steps and highlight some underutilized tools that will save your sanity, as well as a lot of money. If you can’t wait, well, buy yourself a copy of the book I referenced. It doesn’t teach you how to do the stats, just how to actually run an experiment in the real world once you do know the stats.